201 (11 July 1944), 202, 203, 205, 206, 207, 208, 209, 210, 211, 212, 213, 214, 215, 216, 221, 223, 224 (A), 226(A), 227, 228, 230, 231, 234(AS), 235, 236, 239, 240, 242, 252, 253, 256, 259, 263, 266, 268, 271(10 Nov. 1944). (A) Non-Credited aborted missions: (225) - No. 4 prop ran away. 4:38 hours flight time; (226) Internal failure #4 engine. 5:29 hours flight time. (AS) Credited aborted sortie. Unable to bomb due to weather and lead B-17 equipment failure. For Mission dates, targets and Mission Reports, see Combat Missions. 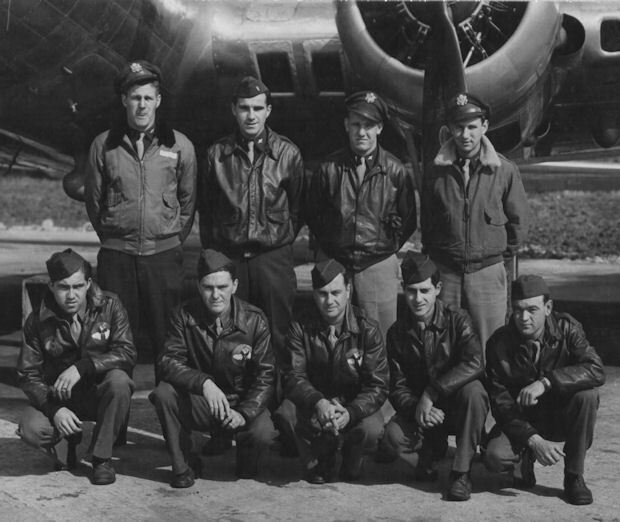 1Lt Nugent (B) - Not on 1Lt Freeland missions (4 missions - 253, 256, 263, 268); With other Pilots (5 missions - 249, 251, 253, 256, 260). S/Sgt Moran (WG) - Not on 1Lt Freeland missions (8 missions - 252, 253, 256, 259, 263, 266, 268, 271). With other Pilots (7 missions -283, 284, 286, 289, 290, 291, 293). Did not fly with the 1Lt Freeland crew after 13 September 1944 (Mission 242) Completed combat tour on 30 Dec 1944 (Mission 293). S/Sgt Dyszel (TG) - Not on Freeland missions (266, 271). With other Pilots (272, 273). Completed combat tour on 16 November 1944 (Mission 273). Sgt Ronald A. McDougall (WG) - Removed from the 1Lt Freeland crew and transferred out of the 358BS on 18 July 1944 when crew size was changed from 10 to 9 men. Flew no 303rd BG(H) combat missions. 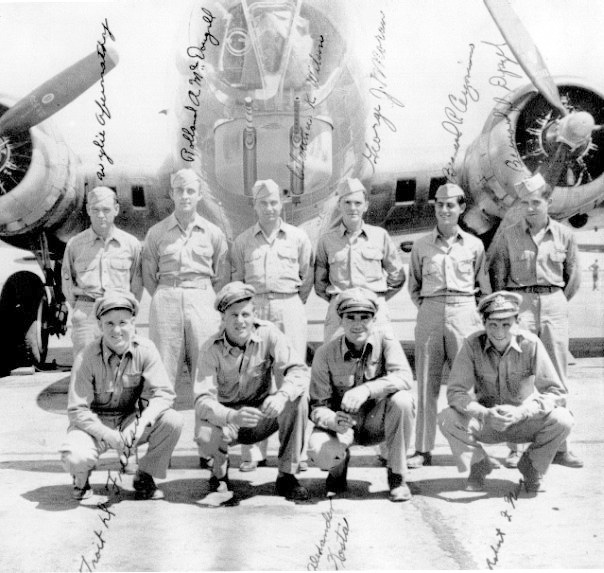 Crew Incident: The crew complained during the 13 September 1944 mission 242 post mission debriefing that food in the mess hall was very poor and that Wieners and Sauerkraut served to them on the previous day was "Not good flying food." There is no record as to whether this complaint resulted in better "flying food."